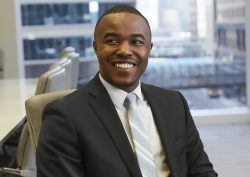 Pharaoh Lewis is a skilled associate helping to defend clients in the areas of product liability and business litigation. Clients will benefit from the negotiation and communication skills Pharaoh honed as a judicial law clerk and extern for Hennepin County District Courts. As a legal intern working for the Minnesota Timberwolves, he further sharpened his legal skills by drafting legal memoranda summarizing the NBA’s collective bargaining agreement and uniform player contracts. Pharaoh also gained legal experience learning from corporate in-house counsel as an extern with Target Corporation’s law department. When he’s not practicing law, Pharaoh is passionate about sports. He’s a big NBA fan and still plays pickup basketball. His football loyalties lie with New Orleans, his hometown. Pharaoh is also an avid reader and Game of Thrones fan.